Who owns the center? How long has the center been open? Audrey Singleton established Richmond Hill Montessori Preschool in 1994. She observed that the community needed a clean, safe learning environment for its young children, and built Richmond Hill Montessori to fit that role. Children are allowed up to 10-hour days at the school, from 6:30 AM to 6:15 PM. Yes. 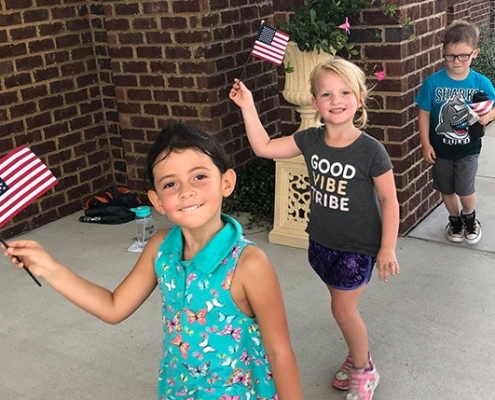 Our preschool operates outside of the normal school schedule, so we offer extended care hours for our Pre-k and Kindergarten students as well as before and after school care for elementary and middle school students at Richmond Hill Primary, Carver Elementary, and Richmond Hill Middle School. We also offer holiday care during school breaks. Do you accept funding from the CAPS program? Yes. We are a state accredited Quality Rated program. How do you help children transition from home to preschool? The first week of school, we ask that you participate in a transition week. This typically consists of three days. The first day you are present on site about 2 hours, and then you and your child leave. The next day you are here until about 11:30; your child will have lunch with us, and then you will leave together again. The third day, you stay to make sure drop off goes smoothly and then return around 2:30 to pick up. Thursday and Friday are usually regular drop off days unless you need them for transitions. Every child is different. Most educators and psychologists today agree that the single most important period in the development of a person’s intelligence occurs between birth and age five. A child’s mind is extremely open and his curiosity is at a peak during these early years. When properly nourished and stimulated, the child’s mind forms patterns for learning that serve him well throughout his life. The Montessori system of preschool education has proven to be one of the most effective and fastest growing methods to guide a child through these critical years. Dr. Maria Montessori, over 80 years ago, was Italy’s first female medical doctor. Using her scientific background, she began observing children in the schools of Rome. Based on her unbiased observations, she developed unique materials, a child-centered school room, and was one of the first people to modernize educational thought by stressing respect for the child, freedom of expression, self-education and training through the use of movement and the senses. The Montessori classroom is a child-sized world. Whatever is in the world outside can be incorporated meaningfully in the Montessori classroom. To a child, the world is unmanageable if it is too big, too complex and too confusing. By careful selection of materials by the teacher, a classroom setup is that which allows the child a place to explore life on a level they can understand. The materials or exercises are designed to stimulate independent exploration. This prepared classroom entices the child to proceed at their own pace from simple activities to more complex ones. Through this process, the child’s center around Practical Life, Sensorial, Math, Language, Geography, History, Science, Art, Music, Drama and Dance. Children who have been in a Montessori classroom are generally very flexible and adjust quite easily to the public school situation. They are usually better students and spend their time in better ways because of their self-direction and positive attitude towards learning. Unfortunately, our preschool classes are full-time. Part time hours are only extended to before/after school care for children in Kindergarten-7th grade.